When it comes to Thai chili dipping sauces (known in Thai as nam prik or nam phrik), nothing is more common or widely loved than nam prik kapi (น้ำพริกกะปิ). 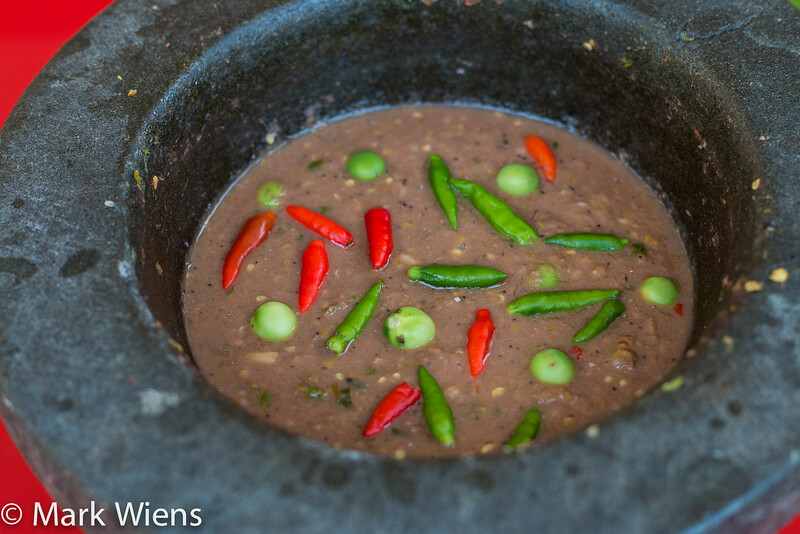 Nam prik kapi is perhaps the most famous of all the Thai chili sauces, made with fermented shrimp paste, chilies, and lots of lime juice. I hope you enjoy this recipe. Make sure you watch the video below (it not only includes the method, but also a little story behind where I bought a bunch of shrimp paste), and leave a comment at the bottom of this post! What is fermented shrimp paste? First, let’s quickly go over, what is fermented shrimp paste? 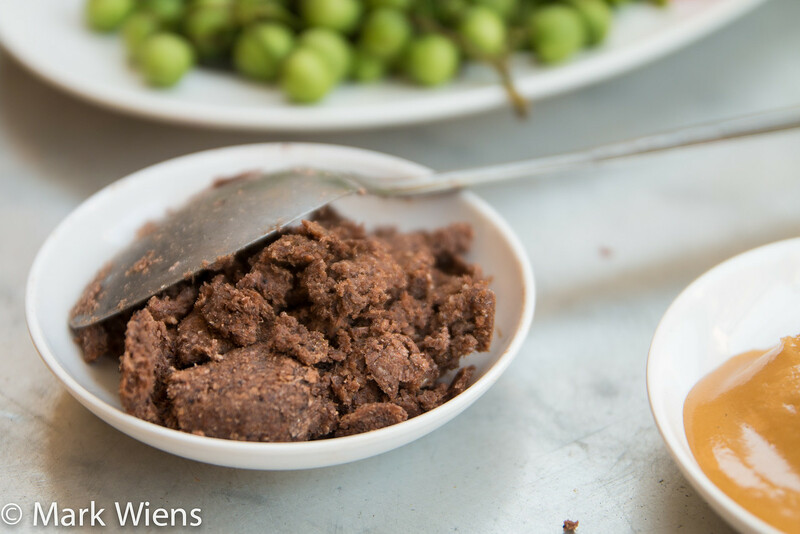 Kapi (กะปิ sometimes in English it’s also spelled kaphi), or fermented shrimp paste, is a typical ingredient used throughout southern China and most of southeast Asia. 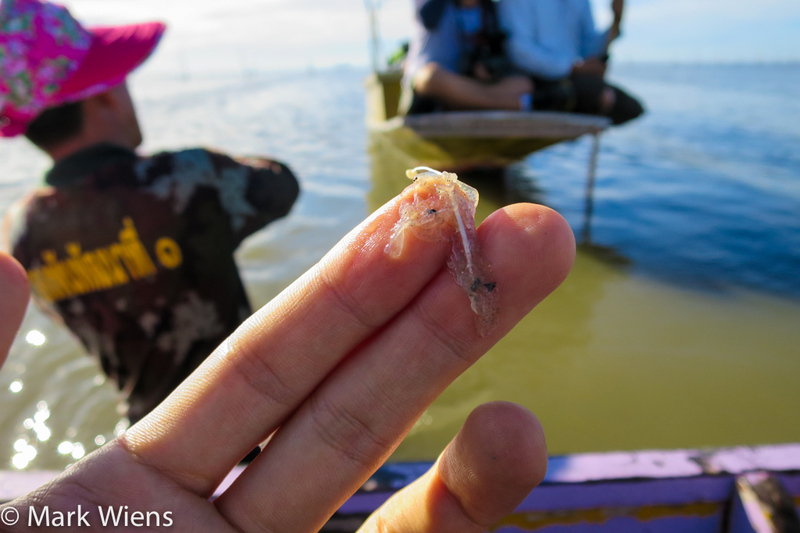 The paste is made from either shrimp or krill (which is very common to use in Thailand), which is heavily salted, then usually dried in the hot sun until dehydrated, before being moved into containers and left to ferment for months or even years. The result, a pinkish purple, or sometimes even brown, paste, is thick and salty, and provides a delicious flavoring enhancement to dozens and dozens of Thai dishes. Almost all Thai curry pastes use shrimp paste in the recipe, and while shrimp paste is used throughout Thailand, it’s used in most abundance in southern Thai cooking, where nearly every dish has a bit of shrimp paste in it. Samut Songkhram (สมุทรสงคราม), about an hour from Bangkok along the coast, is one of the most well known places in Thailand for producing high quality Thai shrimp paste, mostly from krill. I had an opportunity to not only visit a shrimp paste factory, but to also go fishing for the krill in the shallow seas. 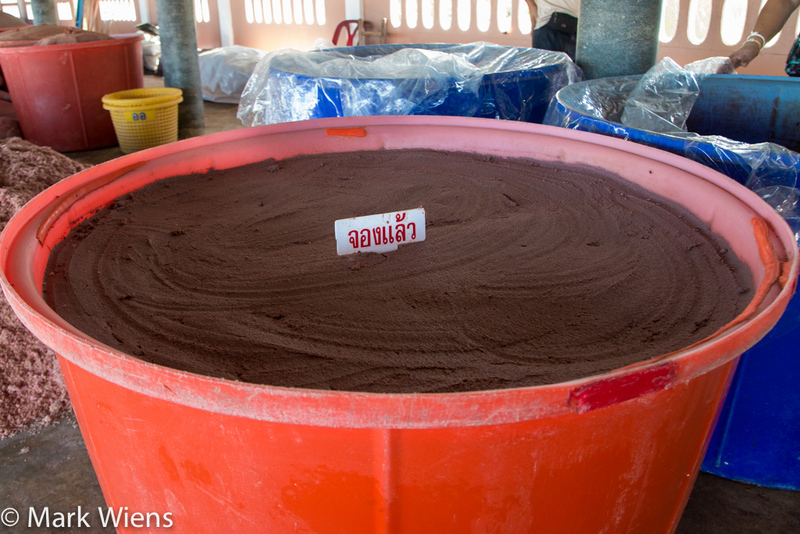 It was pretty cool to learn about how to make shrimp paste and to see exactly where it came from fresh. While I was there, Ying and I decided to buy 700 kg. of shrimp paste… OK that’s a joke! But we did buy a couple of kilos, an amount that I think is a couple years’ supply to bring back her family, and I couldn’t wait to use it to make a recipe for nam prik kapi (น้ำพริกกะปิ) also. 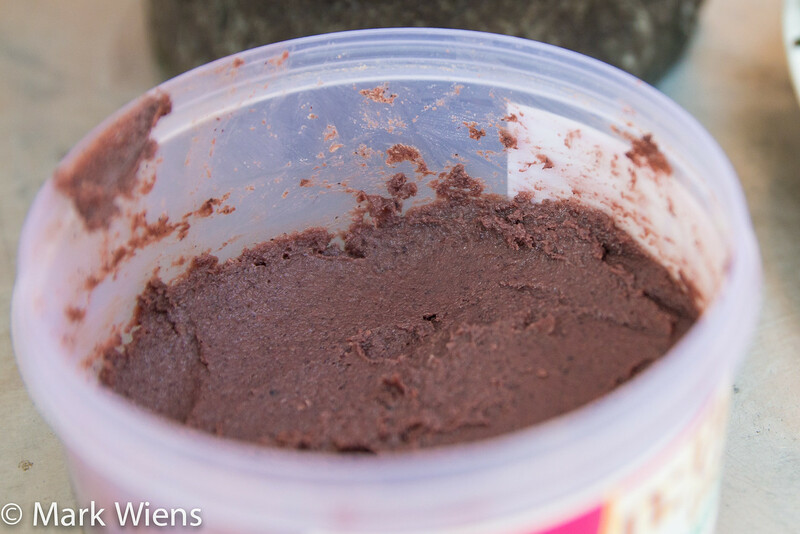 My mother in-law has told me many times that the best type of shrimp paste to use for nam prik kapi is a nice aged and mature shrimp paste because it has a richer and deeper flavor. That’s everything you’ll need for this Thai nam prik recipe (วิถีทำ น้ำพริกกะปิ), the next step is to basically just pound everything together, and taste test until everything is balanced perfectly. Nam prik kapi is quite an easy Thai recipe to make, and doesn’t take much time either. I think the main difficulty is getting good quality and nicely matured shrimp paste. Once you have your hands on some, it’s really simple. The first step to making nam prik kapi (น้ำพริกกะปิ) is to take the shrimp paste, flatten it out into a little patty (doesn’t it look like a hamburger? ), and then roast it over hot charcoal, just for about a minute on either side. As soon as you put the shrimp paste over the hot coals, you’ll immediately start to smell the wonderful aroma. After just a minute of grilling the kapi (กะปิ), take if off the heat and set it aside. Again, this step of roasting the shrimp paste is just going to slightly bring out the fragrance, so it’s not a completely necessary step – it would still taste good without doing this. 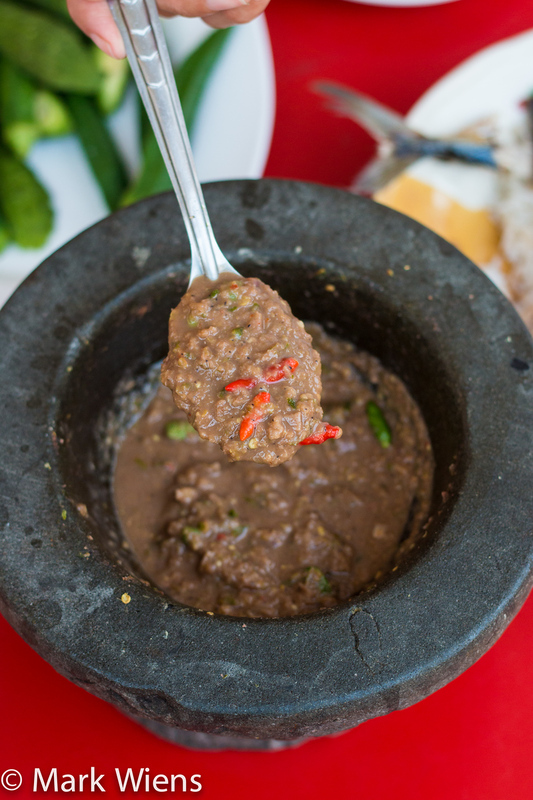 The Thai shrimp paste sauce wouldn’t be delicious just on its own, because it’s the mix of flavors, the kick of spicy chilies, raw garlic, and sour lime juice, that give nam prik kapi so much well rounded and balanced taste. Just peel both the shallots and garlic, then set them aside, and break off the stems of the chilies. For this Thai nam prik recipe (น้ำพริกกะปิ), I pounded and added about 40 Thai bird’s eye chilies into the actual sauce, and then I sprinkled about 20 chilies or so on top. So altogether I probably used 50 or 60 chilies. But keep in mind these are the small little Thai bird’s eye chilies, known in Thai as prik kee noo suan (พริกขี้หนูสวน). You definitely want your Thai chili sauce to be spicy, as after-all, it is a chili dipping sauce, however, you can decided how many to add to your liking. Turkey berry (มะเขือพวง), or as I normally call it pea eggplant, is a common, yet not always present ingredient used in making nam prik kapi in Thailand. Some food vendors will add it if it’s available and if they have it on hand, and others will skip it altogether. Pea eggplant doesn’t really add any extra flavor to this shrimp paste sauce, so it’s not entirely necessary, it just adds a bit of extra texture, and some green color. 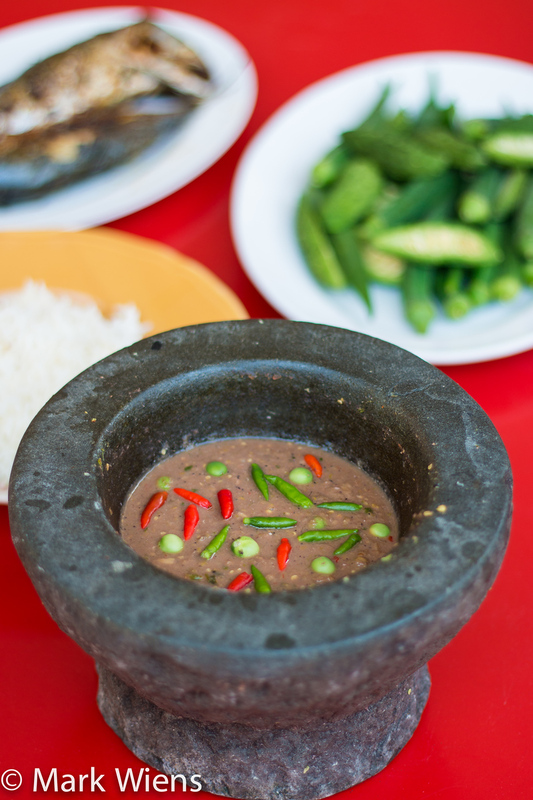 In order to make nam prik kapi (น้ำพริกกะปิ), it’s really best to have a stone mortar and pestle and grind all the ingredients by hand. If you don’t have a mortar and pestle, you could probably get away with using food processor or blender to puree all the chunky ingredients, but I think the flavor, slow releasing all those oils from the garlic, shallots, and chilies, is best if you can do it by hand. The first step is to toss in all the peeled garlic, shallots, and chilies, and just pound and grind them into a coarse paste. I pounded for about 10 minutes to get the consistency I wanted. It doesn’t need to be as smooth as a Thai curry paste, but you’re looking for a semi-smooth paste with not big chunks. I probably pounded for about 15 minutes or so. Then add a couple of pea eggplant, and give them just a gentle pound. The next step is to add in the shrimp paste, already fragrant from the grill. Though you could shift everything over to a bowl, it’s easiest to just mix everything in the mortar, and that way you can sort of stir and lightly pound all at the same time. 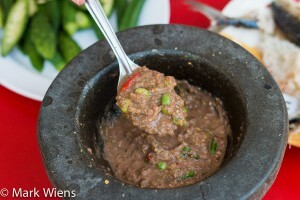 Add in both the shrimp paste and the palm sugar, and then mix it thoroughly with the ground garlic and chilies. Finally add the lime juice, and for this recipe I like to just squeeze it directly from the lime to the shrimp paste sauce. 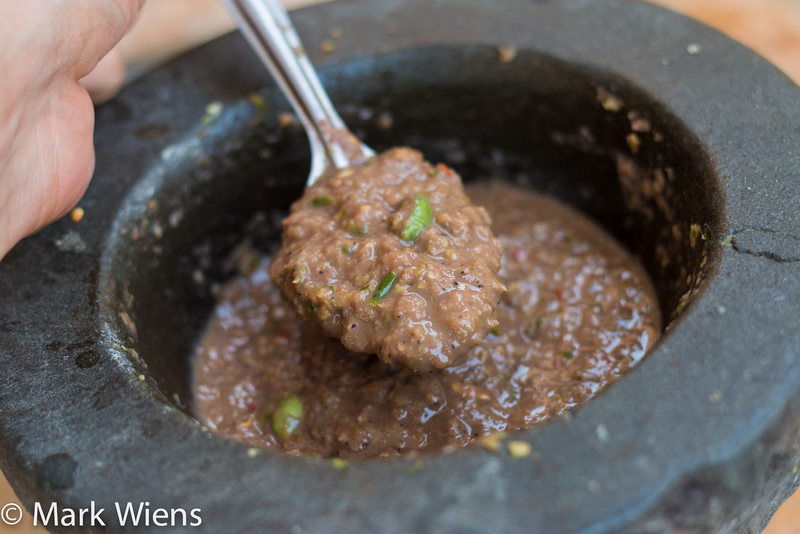 I used 3 limes in this nam prik kapi sauce (น้ำพริกกะปิ), but you may want to start with less, and add more as needed. Make sure to mix everything thoroughly. It should be saucy in texture, not too thin, and not too sticky or thick. Some people add in a splash of water to thin it out a bit, but I prefer to only use the liquid from lime juice, because I don’t like to water it down and tone down the flavor of the shrimp paste. When making Thai shrimp paste chili sauce, like just about every other Thai dish you could make, taste testing is extremely important. Even the most expert of Thai chefs and Thai grandmothers will tell you that you must taste test. Shrimp paste is a variable ingredient, and has many different saltinesses and tastes, so once you have you initial ingredients pounded and mixed in, taste it. Nam prik kapi (น้ำพริกกะปิ) should be salty first, then sour and spicy, with a tiny hint of sweetness coming in at the end from the palm sugar. Keep tasting and adding until you have the perfect balanced taste. For the final step is to decorate your nam prik with some whole Thai bird’s eye chilies and you can also sprinkle in a few more pea eggplants if you like. Also, feel free to dish it out into a serving bowl, but I think it’s pretty cool to serve and eat it directly from the mortar. 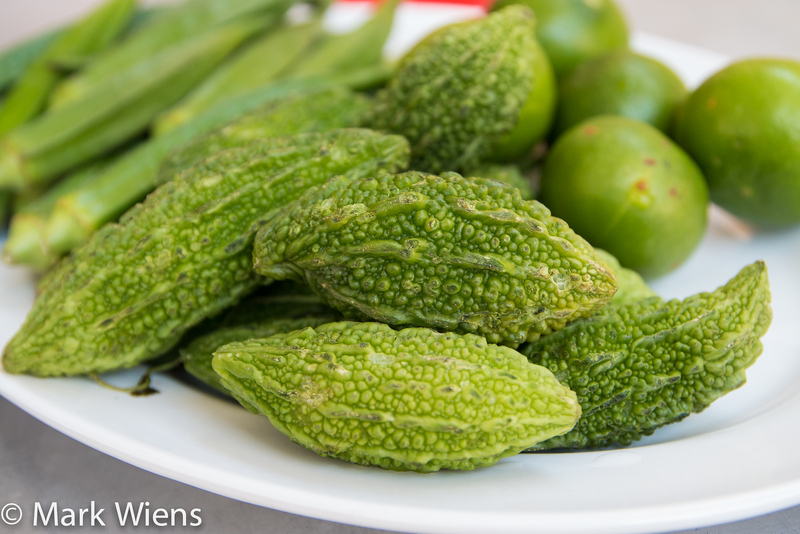 The most common thing to eat with nam prik kapi (น้ำพริกกะปิ) is boiled or raw vegetables, really of any kind you want. Blanch the vegetables in hot water for a minute, or just eat them raw. 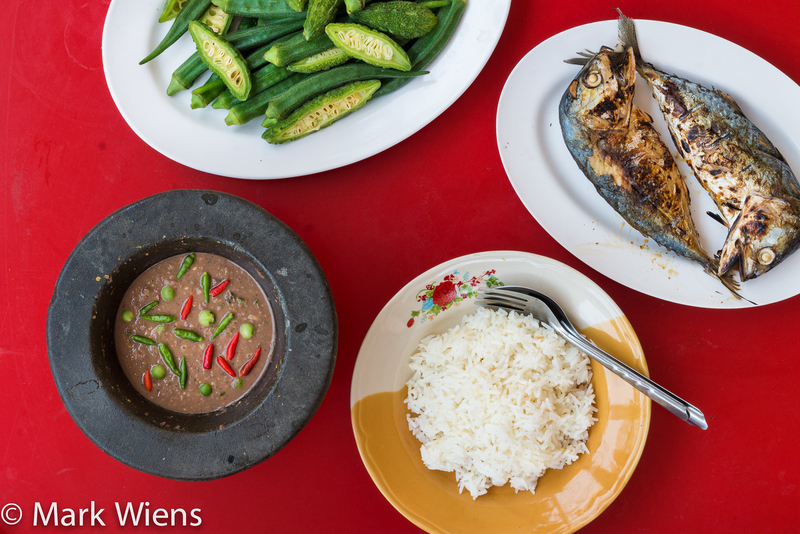 Along with boiled vegetables and rice, one of my favorite things to eat nam prik kapi with is fish, often short mackerel (pla too ปลาทู). On the streets of Bangkok most the time the mackerel is either deep fried (most common) or grilled, and both ways are fantastic, though I would choose grilled over fried most days. 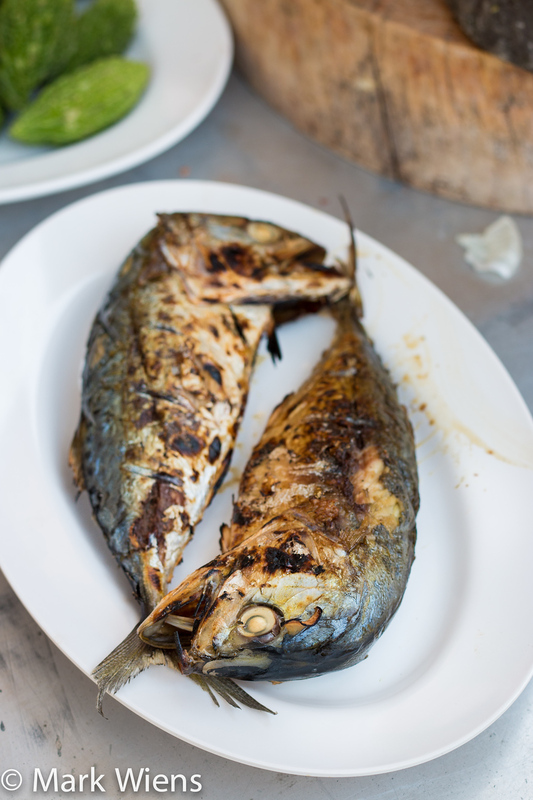 Short mackerel fish is firm and rich, and it goes incredibly well with a plate of hot rice and a scoop of the salty sour shrimp paste sauce. At street food stalls selling nam prik in Thailand, you’ll also normally find things like omelets made with climbing wattle (cha om kai ชะอมไข่), and a variety of of other crispy fish to eat with the nam prik as well. Packed with so much flavor! 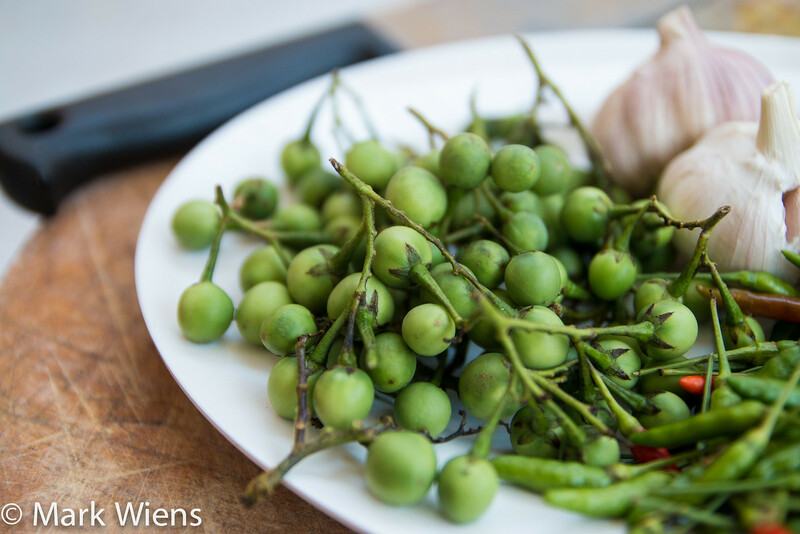 There are two methods to eating nam prik kapi, which I explained in more detail here. In Thailand it’s common to take a little wad or piece of vegetables and dip straight into a communal bowl of nam prik kapi and eat. Alternatively, it’s also common and acceptable to place some vegetables or fish on your individual plate of rice, and then add some nam prik kapi over the top using your spoon from the communal bowl. Either way, rice should always be part of this meal. Nam prik kapi (น้ำพริกกะปิ) is a household Thai food, available nearly everywhere and widely loved. 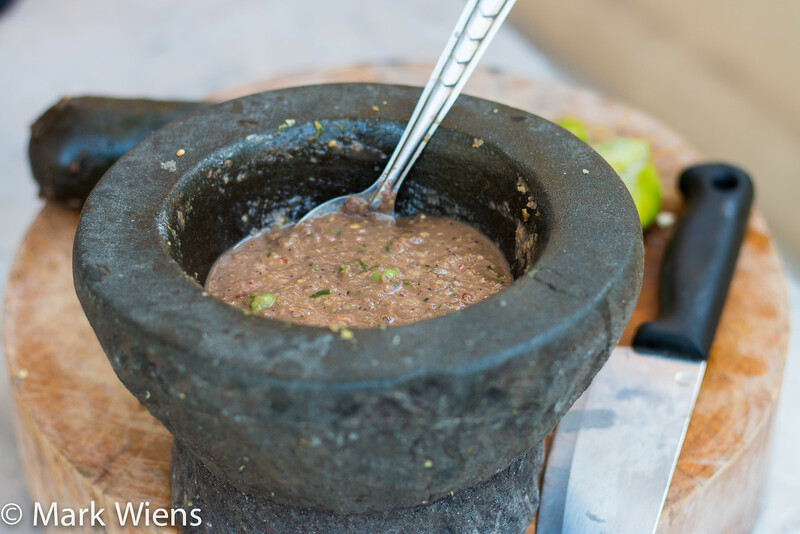 The main ingredient is fermented shrimp paste, which is pounded along with chilies, garlic, and lime juice to create a beautiful Thai chili dipping sauce that’s well rounded with flavor. I’m a huge fan of nam prik kapi, and I think it makes a wonderful condiment to eat with a full meal of meal of vegetables, rice, and fish. This recipe is easy to make, and mostly just requires pounding and mixing up all the ingredients. Enjoy! 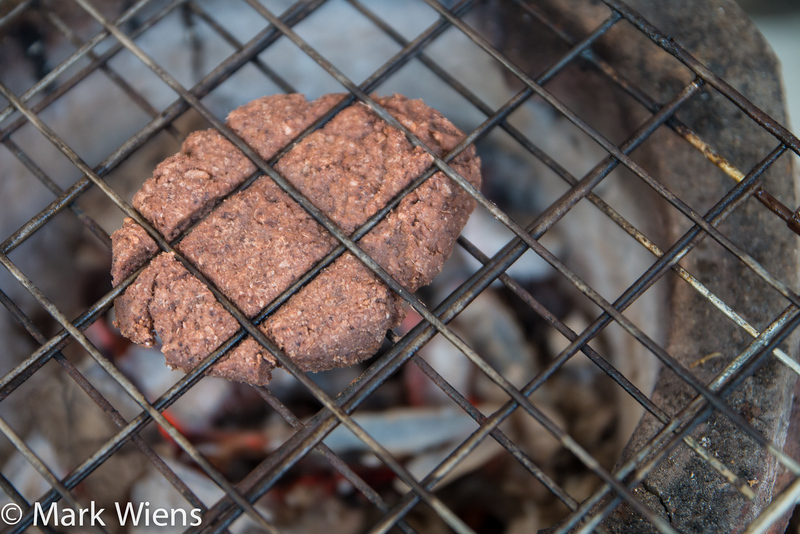 The first step is to take 2 tbsp of shrimp paste, flatten it out into a little patty, and grill it over high heat charcoal. You should immediately start to smell the aroma of the shrimp paste. Allow the shrimp paste to just sizzle for about a minute on either side, then remove from the grill. This step is optional, but it increases the fragrance of the shrimp paste. Set aside. Peel the shallots and garlic, and rip off the stems of the Thai bird's eye chilies. In a mortar and pestle, pound the garlic, shallots, and chilies for about 10 minutes until you get a nice semi-smooth oily paste. Add about 10 pea eggplant to the mortar, and gently crush them, just to release the seeds. Then add the shrimp paste and palm sugar to the mortar, and pound and mix simultaneously for about a minute until the mixture is even. Then add about 3 tbsp of lime juice to start and mix everything together, still in the mortar, with a spoon. Now to taste test. The nam prik kapi (น้ำพริกกะปิ) should be like a sauce in texture, and should be salty, sour, and spicy, with only a faint hint of sweetness. Add more lime juice or chilies as needed to balance the taste. 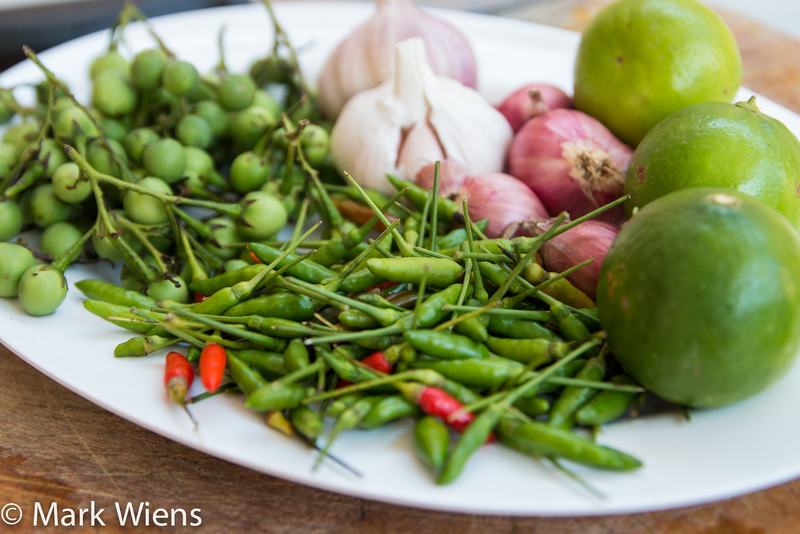 Once finished, garnish with whole Thai bird’s eye chilies and more pea eggplant. For the vegetables, either serve them raw, or blanch in hot water for 1 - 2 minutes. Serve nam prik kapi (น้ำพริกกะปิ) with any kind of vegetables, fish, omelets, and hot steamed rice. Thank you very much for reading and cooking this recipe. If you haven't already seen the video, you can watch it here. Nam prik kapi (น้ำพริกกะปิ) is a Thai chili sauce made with fermented shrimp paste, chilies, and lime juice. 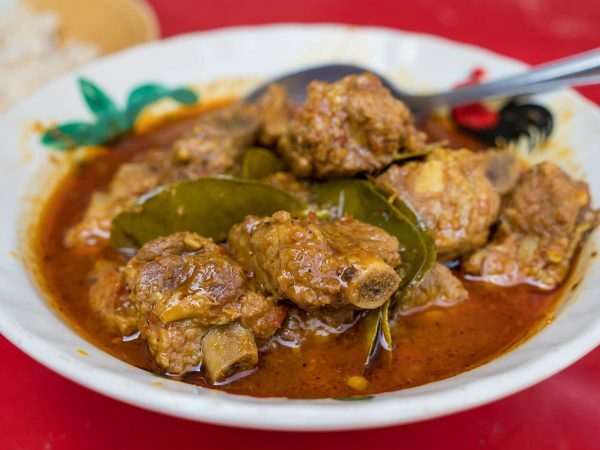 It’s among the most widely available and typical everyday dishes throughout Thailand. 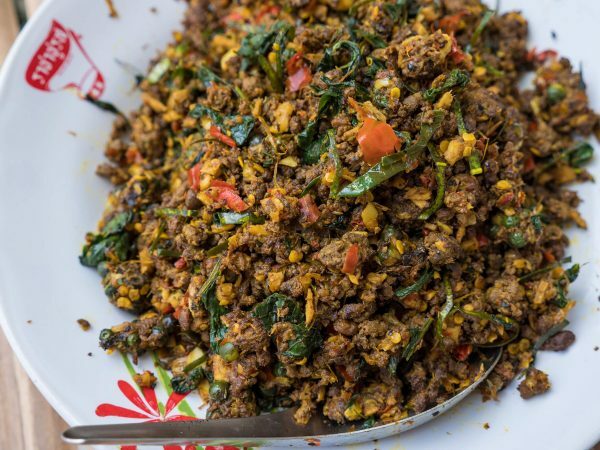 This recipe is easy to make, only takes a few minutes, and the shrimp paste sauce tastes extremely good with vegetables, fish, and Thai style omelets. If you like spicy and garlicky flavors, try this recipe for nam prik kapi. Thank you very much for reading (and watching the video) for this recipe. If you enjoyed it, I would really appreciate it if you would share it with a friend (on social media or e-mail) who loves to cook and eat Thai food. Thank you in advance! 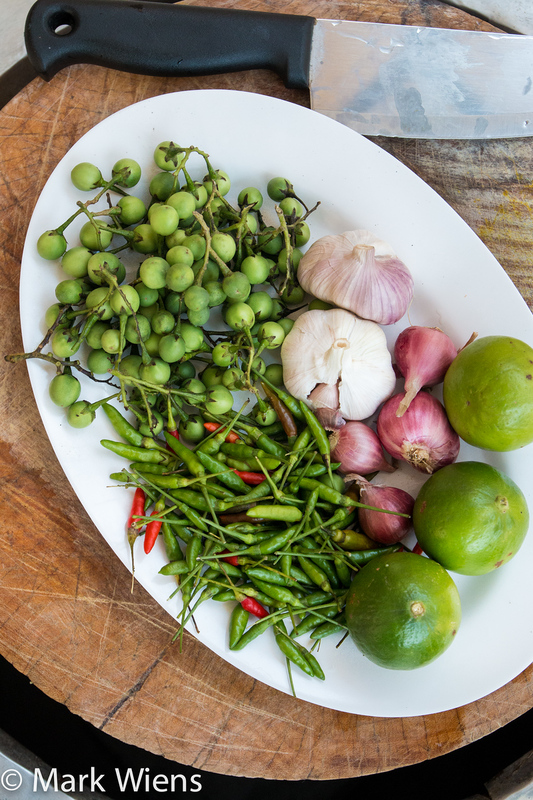 For more Thai cooking, check out all of our recipes here. I really enjoy your Nam prik kapi recipe it is very tasty. Thank you a lot. Please can you tell me the brand of the shrimp paste..
thanks for the recipe, I really loved it! Do you have an idea how long you can store it? Thanks for this chilli guide. 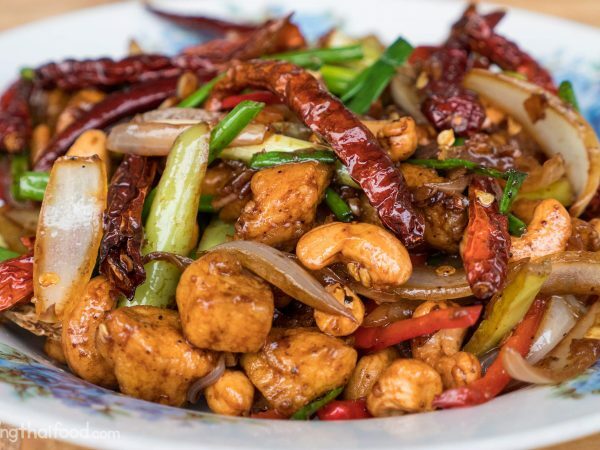 I’m trying to find a recipe for a chilli flake that is like Mae Pranom Shrimp Flavour Crushed Chili but really hard as I think I need to find via its Thai name. Is it Amy of th ones you mentioned in this post? This is one of my most favorite things to eat in Thailand. In Trat and the cook pounded fresh crab roe into it . It was possibly the best I have ever had. Thank you very much Khatijah. Awesome to hear that, enjoy! Made the nam prik Kapi as per your instructions. The outcome was VERY salty, VERY fishy, but in a funky way and a little bitter. Had to use 4 small limes for the right consistency. Added a bit more palm sugar to help it out. Any suggestions? Hey Steve, sorry about that, that’s the challenge when writing Thai recipes – all the ingredients can taste different – even between batches of shrimp paste. Maybe use less shrimp paste, and more lime juice, and start with a little of everything, and keep adding until it’s a balanced sauce. What type of shrimp paste are you using? Any suggestions for a better quality shrimp paste here in the States? Hey Steve, I haven’t been to the States in a while, so I really don’t know what is available. Have you found any Thai food shops? I guess it really depends on what city you are living in, but there may be some in LA or NYC. I’ll let you know if I learn anything, thanks. What an absolutely fantastic taste sensation! Then I find this recipe in January and tomorrow is the 5th time I do it here in Europe. My kids (!) likes nam prik kapi also after the first chilli chock. Hey Mats, great to hear from you, I’m so happy to hear that you enjoy Thai food as well. Glad your whole family loves nam prik kapi, enjoy! Hey Jonathan, when the chilies are pounded and mixed with the lime juice and other ingredients, they start to blend in to the other ingredients, so they aren’t too spicy like they would be on their own. But yes, they are spicy, and if you were to eat this nam prik on its own, it would spicy, but it’s meant to be eaten with vegetables and rice. It’s a bit spicy but not too much. If you give it a try, let me know how it goes! I’ve been wanting to make this correctly so I’ll give this recipe a try. Looks great! I have two questions. If you can’t get the eggplants, are there any suitable substitutions? Second, how long does this keep? Thanks for checking this out. For the pea eggplant, if you can’t find it, I would just eliminate it, it’s not necessary, and even in Thailand it’s not always included. Once it’s mixed, with the fresh lime juice, it’s best to eat that same day, or maybe in the fridge just 1 or 2 days. I think you’ll find it tastes best the same day. Cool, thanks! I’m always looking for new ways to study Thai food. I’m glad I found your site! Is there anyway is properly jarred and refrigerated it can last more than 1-2 days?